Welcome to Congregation Brit Shalom in State College, Pennsylvania. We are a Reform congregation of 200 families and singles open to Jews of all backgrounds who seek Jewish community and Jewish education. Our building has a sanctuary, library, classrooms, social hall and kosher kitchen. 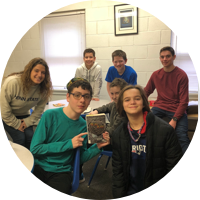 We have a Chevra Kadisha and a caring community always ready to support those in need. If you are in the State College Community on business or to see the local Penn State Nittany Lions play football, please join us for services. We offer programs for children of all ages, including a pre-school, and a religious school for Grades K-7. We also offer a number of adult study and discussion groups. "On three things does the world stand: on Torah, on Worship, and on Deeds of Lovingkindness."